Cream/offwhite pages, nice copy, scan will be posted when book comes in CGC 4.0 VG $30,000 New Make An Offer! Cream/offwhite pages CGC 5.0 VG/F $1,600 New Make An Offer! Offwhite/white pages CGC 6.5 F+ $1,400 New Make An Offer! White pages CGC 9.6 NM+ $5,750 New Make An Offer! Offwhite pages, rich color, tiny bottom left corner wear, really really nice copy CGC 9.2 NM- $13,500 New Make An Offer! Offwhite pages, small sunshadow along bottom of back cover VF $225 New Make An Offer! Offwhite pages F+ $125 New Make An Offer! Offwhite/white pages VF/NM $210 New Make An Offer! Cream/offwhite pages, 2nd Highest graded copy as of 4/11/19 CGC 9.4 NM $1,250 New Make An Offer! Cream/offwhite pages CGC 9.2 NM- $750 New Make An Offer! 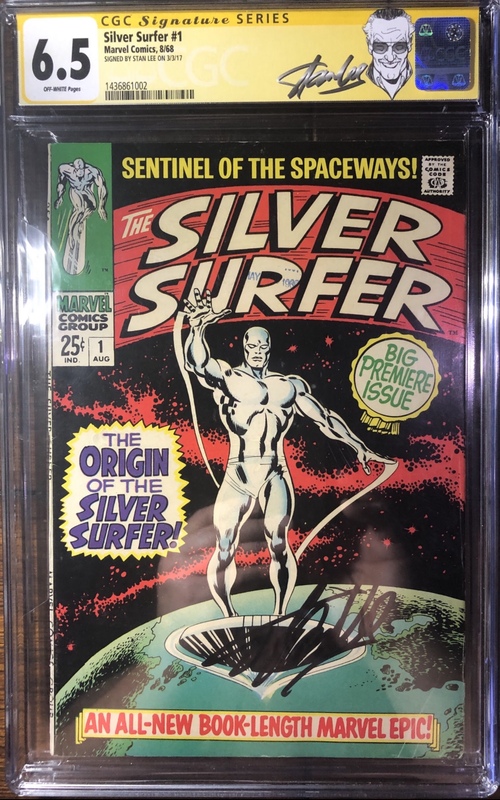 Signature Series - Signed by Joe Simon on 10/15/09, Cream/offwhite pages, small amount of dried glue on detached centerfold, 1 piece of tape on interior cover CGC 3.5 VG- $105,000 New Make An Offer! Offwhite/white pages CGC 7.5 VF- $8,750 New Make An Offer! White pages CGC 9.4 NM $975 New Make An Offer! Offwhite/white pages, distributor spray top of back cover, sweet copy NM- $750 New Make An Offer! White pages CGC 9.2 NM- $400 New Make An Offer! White pages CBCS 9.2 NM- $400 New Make An Offer! RESTORED - offwhite/white pages, small amount of color touch, small amount of glue on spine/cover, spine split and reattached with tape, 3 edges trimmed VG+ $6,000 New Make An Offer! Offwhite/white pages CGC 6.0 F $600 New Make An Offer! Offwhite/white pages CGC 6.5 F+ $750 New Make An Offer! Offwhite/white pages CGC 7.0 F/VF $2,500 New Make An Offer! Offwhite/white pages, nice eye appeal, white cover CGC 9.4 NM $2,850 New Make An Offer! Off-white/white pages, tiny spots of foxing on back cover CGC 9.0 VF/NM $2,250 New Make An Offer! Cream/offwhite pages CGC 9.0 VF/NM $1,200 New Make An Offer! Offwhite/white pages, very nice 9.0 CGC 9.0 VF/NM $575 New Make An Offer! Offwhite/white pages, 123 written on splash page CGC 7.0 F/VF $2,250 New Make An Offer! Offwhite/white pages CGC 7.0 F/VF $550 New Make An Offer! Cream/Offwhite pages CGC 9.4 NM $1,650 New Make An Offer! RESTORED Slight B-1 - offwhite/white pages, tear seals cover/interior, cover and centerfold reinforced CGC 2.0 G $5,000 New Make An Offer! Offwhite/white pages, distributor spray mark above Marvel Comics Group CGC 8.0 VF $4,500 New Make An Offer! Cream/offwhite pages VF $250 New Make An Offer! Offwhite pages VG $65 New Make An Offer! Offwhite/white pages CGC 8.0 VF $1,450 New Make An Offer! Off-White Pages CGC 6.5 Stan Signature Series Label. Stan’s signature beautifully placed on front cover. As far as I know it’s never been pressed or cleaned. CGC 6.5 F+ $4,000 New Make An Offer! Offwhite pages, 1 inch chip of top right corner VG+ $285 New Make An Offer! Cream/offwhite pages, heavy staining, large stamp on front cover G $80 New Make An Offer! Offwhite pages, MAR 3 D stamped on front cover G+ $85 New Make An Offer! Offwhite/white pages, 2 inch pre-marvel chip along right edge of front cover F/VF $400 New Make An Offer! Cream/offwhite pages, 35 written on front cover in grease pencil VG- $105 New Make An Offer! Offwhite pages, tanning inside covers F+ $210 New Make An Offer! Cream/offwhite pages, well read, complete Fr $38 New Make An Offer! Cream/offwhite pages F $185 New Make An Offer! Cream/offwhite pages, tanning inside covers F $225 New Make An Offer! Cream/offwhite pages, chip off top back cover, tanning inside covers VG+ $135 New Make An Offer! Offwhite/white pages VG $125 New Make An Offer! Offwhite/white pages F+ $210 New Make An Offer! Offwhite/white pages, some small chipping in top overhang on back cover F $190 New Make An Offer! Offwhite pages, 4th wrap right page has 6 inch long, 1/8 inch deep piece missing, does not affect story F $325 New Make An Offer! Offwhite pages G $325 New Make An Offer! Offwhite/white pages F $195 New Make An Offer! Offwhite/white pages, small 9-6 written on front cover in pen, slight top cover miscut F/VF $325 New Make An Offer! Offwhite/white pages, 1 piece of tape inside front cover VG $125 New Make An Offer! Cream/offwhite pages, chip off bottom back cover, 062 stamped on bottom of back cover VG/F $135 New Make An Offer! Offwhite/white pages F $185 New Make An Offer! Offwhite/white pages, small tear on top of back cover F+ $210 New Make An Offer! Offwhite/white pages F/VF $285 New Make An Offer! Offwhite pages F- $550 New Make An Offer! Offwhite/white pages F $160 New Make An Offer! Offwhite pages, marvel chipping VG $105 New Make An Offer! Offwhite/white pages F $165 New Make An Offer! Offwhite/white pages F+ $600 New Make An Offer! Offwhite/white pages VF- $300 New Make An Offer! Offwhite/white pages VF- $285 New Make An Offer! Offwhite/white pages VF+ $575 New Make An Offer! Offwhite/white pages VG+ $110 New Make An Offer! Offwhite/white pages VF+ $425 New Make An Offer! Offwhite pages, tape on inside front cover G+ $80 New Make An Offer! Offwhite/white pages, small 8 written on front cover in pen VG $65 New Make An Offer! Offwhite/white pages, tiny nick on front cover, nice copy VF- $600 New Make An Offer! Offwhite pages VG- $110 New Make An Offer! Offwhite/white pages, tiny tear in top of front cover VF $210 New Make An Offer! Offwhite pages G+ $36 New Make An Offer! Offwhite/white pages VG/F $240 New Make An Offer! #2 Spidey Vs Torch, sharp! Offwhite/white pages VF- $725 New Make An Offer! Offwhite/white pages, small tear bottom back cover, nice copy F+ $600 New Make An Offer! Offwhite pages VG $325 New Make An Offer! Offwhite pages, small 6-11 written on front cover in pen, July 59 - new written on front cover in pencil VG $250 New Make An Offer! Offwhite pages F $350 New Make An Offer! Cream/offwhite pages, 11/7 written on front cover in pen, 5 written in grease pencil, 054 stamped on back cover F $260 New Make An Offer! Cream/Offwhite pages, 100 written on front cover in pen F $245 New Make An Offer! Offwhite pages, small tear bottom back cover F+ $250 New Make An Offer! Offwhite/white pages, tanning inside covers F+ $250 New Make An Offer! Offwhite pages F- $180 New Make An Offer! Offwhite pages VG+ $180 New Make An Offer! Offwhite pages VF- $475 New Make An Offer! Offwhite/white pages, small 7/14 written on front cover in pen F $180 New Make An Offer! Offwhite pages F $180 New Make An Offer! Offwhite pages VF+ $800 New Make An Offer! Offwhite/white pages VF- $325 New Make An Offer! Offwhite/white pages, 3 small marvel chips, one pre-marvel tear F+ $210 New Make An Offer! Offwhite/white pages VF $425 New Make An Offer! Offwhite/white pages VG $150 New Make An Offer! Offwhite pages, KIRBY written on splash page in pen, marvel chipping along right edge G+ $120 New Make An Offer! Offwhite/white pages F/VF $300 New Make An Offer! Offwhite/white pages, small chip off back cover corner F $165 New Make An Offer! Offwhite/white pages, 2 small marvel chips off right edge of front cover F- $150 New Make An Offer! Offwhite pages, slight marvel chipping along right edge of front cover F- $150 New Make An Offer! Offwhite/white pages F+ $185 New Make An Offer! Offwhite/white pages VF- $375 New Make An Offer! Offwhite pages G $250 New Make An Offer! Offwhite pages G- $135 New Make An Offer! Offwhite pages G $100 New Make An Offer! Offwhite pages, COMPLETED stamped on back cover G $100 New Make An Offer! Offwhite/white pages, JUL 13 stamped on top of back cover VG+ $250 New Make An Offer! Offwhite pages, 6 written on front cover in pen G+ $80 New Make An Offer! Offwhite pages VG/F $175 New Make An Offer! Offwhite pages, 3 extra staples on spine, small 5 written on front cover G $65 New Make An Offer! Cream/offwhite pages, 6 written on front cover in pen, cover almost detached from top staple G $90 New Make An Offer! Offwhite pages, 6 written on front cover in pen VG- $100 New Make An Offer! Offwhite pages, 6 written on front cover in pen, pen scribbling bottom of back cover G $36 New Make An Offer! Offwhite pages, 6 written on front cover in pen VG $125 New Make An Offer! Cream/offwhite pages, 6 written on front cover G+ $36 New Make An Offer! Cream/offwhite pages, 6 written on front cover, 1 inch top spine split G+ $36 New Make An Offer! Offwhite pages, name written on front cover in pen G $32 New Make An Offer! Offwhite pages VG $285 New Make An Offer! Cream/offwhite pages VG $120 New Make An Offer! Cream/Offwhite pages, cover almost completely split Fr $40 New Make An Offer! Offwhite pages, piece out of front cover and splash page, does not affect story G+ $60 New Make An Offer! Offwhite pages VG $60 New Make An Offer! Offwhite pages VG $15 New Make An Offer! Cream/offwhite pages VG $20 New Make An Offer! Offwhite/white pages, large 5 written on front cover in grease pencil F $95 New Make An Offer! Offwhite pages, writing on top of front cover Fr/G $50 New Make An Offer! Offwhite pages VG $225 New Make An Offer! Offwhite pages F+ $325 New Make An Offer! Offwhite pages VG+ $250 New Make An Offer! Offwhitepages F+ $250 New Make An Offer! Cream/Offwhite pages F+ $250 New Make An Offer! Offwhite pages F/VF $400 New Make An Offer! Offwhite pages VF $785 New Make An Offer! Cream/offwhite pages G+ $75 New Make An Offer! Cream/offwhite pages F $180 New Make An Offer! Cream/offwhite pages, 5 written on front cover in red grease pencil G+ $75 New Make An Offer! Cream/offwhite pages F- $150 New Make An Offer! Offwhite pages, SEP 6 stamped on front cover F+ $200 New Make An Offer! Cream/Offwhite pages, centerfold almost detached G+ $65 New Make An Offer! Offwhite pages VG $110 New Make An Offer! Offwhite pages, Really nice copy over but small lower right front cover chip F+ $210 New Make An Offer! Offwhite pages, one marvel chip, few small marvel tears F+ $210 New Make An Offer! Offwhite pages G $60 New Make An Offer! Offwhite/white pages, cover almost split, attached at top staple Fr/G $8 New Make An Offer! Offwhite pages, top 1/3 of front cover torn off Fr $50 New Make An Offer! Offwhite pages F+ $225 New Make An Offer! Offwhite/white pages F+ $225 New Make An Offer! Offwhite pages VF $385 New Make An Offer! Offwhite pages VG/F $100 New Make An Offer! Offwhite pages G+ $55 New Make An Offer! Offwhite pages, 1 inch top spine split, 1 and 1/2 inch tear right edge of front cover VG- $425 New Make An Offer! Cream/offwhite pages VG+ $75 New Make An Offer! Offwhite/white pages F $100 New Make An Offer! Offwhite pages, JUN 11 stamped on front cover VG+ $75 New Make An Offer! Offwhite pages G $30 New Make An Offer! Offwhitepages F/VF $165 New Make An Offer! Cream/offwhite pages VG/F $150 New Make An Offer! Offwhite pages F $60 New Make An Offer! Offwhite/white pages F+ $75 New Make An Offer! Offwhite pages VG/F $50 New Make An Offer! Offwhite/white pages F+ $70 New Make An Offer! Offwhite pages, bottom staple cover pull, still attached, 6 written on front cover in pencil G $20 New Make An Offer! Offwhite pages VG $40 New Make An Offer! Offwhite pages, small water stain on spine F- $100 New Make An Offer! Offwhite pages F- $50 New Make An Offer! RESTRORED - Color touch front cover, Offwhite pages G+ $15 New Make An Offer! Cream/Offwhite pages, R-6 written on top of back cover in pen G+ $50 New Make An Offer! Offwhite pages VG/F $75 New Make An Offer! Gaines File $1,650 New Make An Offer! Gaines File $5,250 New Make An Offer! Cream/offwhite pages, beautiful copy VF- $3,500 New Make An Offer! Cream/offwhite pages, beautiful copy VF $3,500 New Make An Offer! RESTORED - slight C-1), Cream/offwhite pages, small amount of color touch, small amount of glue on spine CGC 8.5 VF+ $250 New Make An Offer! Offwhite/white pages,structurely nicer, sunshadow on back cover VF+ $1,800 New Make An Offer!